We were not made for just this earthly life. As beautiful as our world is, it is not enough. We are created for something more. And that something more surpasses every imagination. Eye has not seen, ear has not heard and no human mind can even conceive of all that God has prepared for those who love Him (I Cor. 2:9). Try as we might, we cannot fathom all that God has done and all He will do. It is inconceivable to me that one can ignore or deny the eternity that God has placed in our hearts. I am His special creation, designed to live forever. And Christ has made it possible to spend that eternity with Him. Thank you Lord, for placing eternity in my heart! 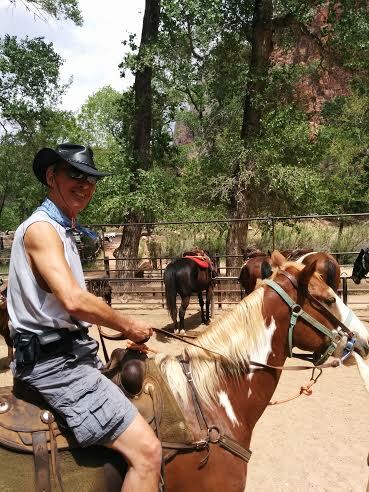 On a recent horseback riding adventure, my husband got the “privilege” of riding the unpredictable one! This unruly horse would bolt and even nudge mine, causing my horse to kick back at him. Unfortunately, he missed, kicking my husband’s shin instead! Bolting up the embankment of a stream he decided to stop suddenly, throwing my poor husband over his head and to the ground! Thankfully, he was able to successfully break his fall, only bruising his ribs and his ego! It happened so quickly, we were all surprised! Our verse for today tells believers not to be surprised at the hard times we suffer. They are not the exception, but the norm. We are not exempt from difficulties, although sometimes we think we should be. We get used to an easy gait and get lulled into thinking that an easy life is our right and privilege as God’s own. Then something sudden happens and we are surprised! Rather than holding on, the ordeal unseats us. The “fiery ordeal” in this verse is not something that is caused by our own wrong choices. It is an ordeal that comes from living as a believer in an unbelieving world. Rather than be surprised at the negative reactions, I am told to rejoice that I can participate in some small measure what Jesus faced. I can expect that others will heap abuse on me (I Peter 4:4). I am not ever to be surprised if the world hates me (I John 3:13). This testing of my faith is never very comfortable! Help me Lord, to stay faithful to You, even when it is hard. We recently heard a nature presentation from a park ranger on snakes we might encounter in the Zion National Park. She quoted this rhyme; “If red touches yellow, you’re a dead fellow. If red touches black, you’re OK, Jack.” As one can see from the photo, touching this Coral snake would not be such a good idea. However, I cannot see myself touching any snake regardless of their color! In any case, one cannot rely on color alone as this rhyme would imply as there are exceptions, especially outside of North America. Our verse for today sounds like a proverb but it is actually a quote Paul uses to address a problem in the church. The saying came from a Greek comedy written by the poet, Menander. The influence of others can be strong enough to corrupt character. In the church at Corinth, the bad company were those teaching that there is no resurrection. Their influence was slowly eroding the character of those who held correct doctrine. Some color combinations do not work and are even dangerous. When we walk with fools we can suffer harm (Prov. 13:20) Paul warns that believers are not to be yoked together with unbelievers (II Cor.6:14). Being yoked with someone means you are walking with them, going the same direction. The direction of a believer is completely different being on a path of righteousness. Of course, I rub shoulders with neighbors, colleagues and family members who do not love the Lord. I show them God’s love and share my story. But I do not walk with them and follow their direction or I could be misled. Lord, keep me from being misled. Help me instead to lead others to You! As I approached the slippery rocks that allowed me to cross the stream, I remembered the advice from a friend; better use a walking stick. 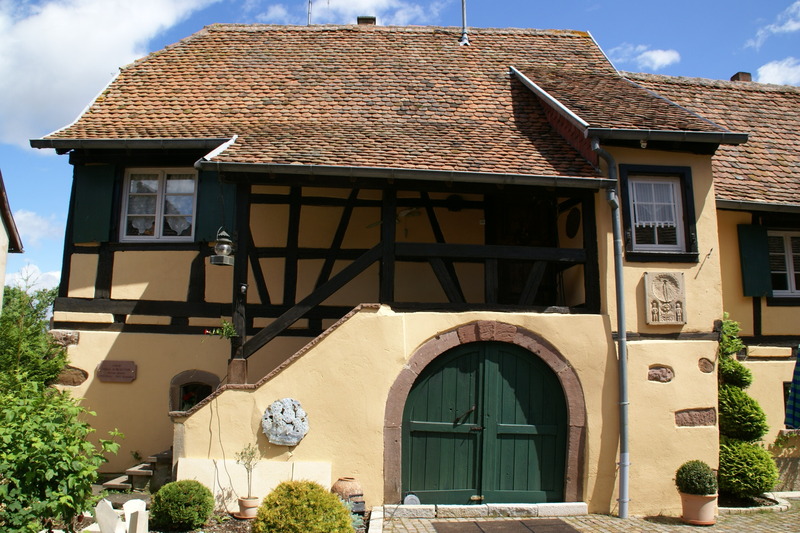 We have two beautiful ones we have used for our Alpine hiking, but they were back at the house. 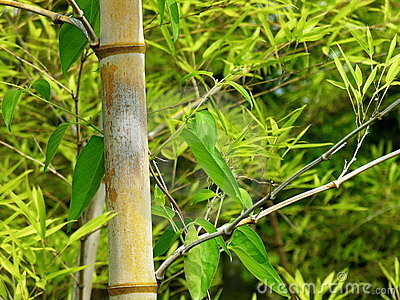 I picked up a dried out bamboo reed to use instead. The problem was that it was too flimsy. It did not support my weight when I leaned on it half way across. Instead of helping me, it just about caused me to fall as it bent in half! Our verse for today came to mind. When I lean on my own understanding rather than trust God, I am using something flimsy that can let me down. It may work for awhile, but at that crucial moment everything can fall apart. My own understanding is so limited. Depending on my own understanding means I may fall down or slip. The path can become difficult with twists and turns that confuse me. There is just so much I do not know. And the more I study Scripture the more I realize I do not know! Thankfully, I have the choice of leaning on Someone far more intelligent and wise than I am. He sees what is ahead. He knows the best course to take. He will not let me down. I do not need to apologize when I lean on Him. He invites me to do so. It is not a sign of weakness to need His strength and direction. Thank you Lord, for holding me up and being totally trustworthy! Help me trust You today. 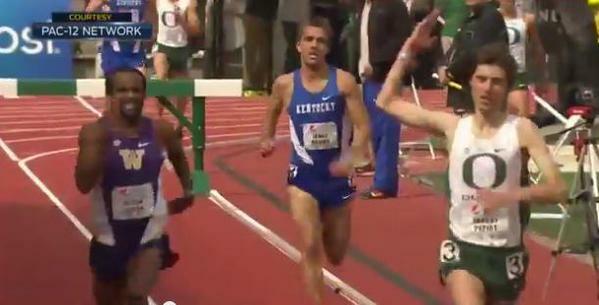 The Oregon runner in green thought he would win the steeplechase at the Pepsi Team Invitational. In fact, he was so confident that he would win that he took it easy those last 100 meters or so. He smiled for the cameras and waved his arm to the crowd, getting them riled up for what he thought would be his victory. He did not notice the runner in purple from Washington sprinting up behind him to win the race. That defeat must have been incredibly humiliating as it was solely due to celebrating too early. Our verse for today talks about being surrounded by a cloud of witnesses. Regardless of who is watching our spiritual progress or lack of it, we run for an audience of One. Our eyes are not on the crowd. Our eyes are not even on the other runners. Our eyes are on Jesus. It is for His pleasure that we run. It is for His approbation of “well done, my good and faithful servant,” that we continue to run with perseverance, even when we feel like throwing in the towel. I want to finish strong. I do not want to celebrate too early or feel I have the right to “rest on my laurels.” There is always more progress to be made. That finish line is still far ahead of me. He will strengthen me. He will keep me up and running. Thank you Lord, that Your forgiveness and power keep me going! Categories: God's Strength and Power, Grace and Forgiveness, Holiness | Permalink. How often I have heard of a deer jumping out in front of a car! They don’t just run, they jump and leap. The deer is so fast and agile. Some species can run 45 miles per hour for a short time on level ground. But the height of their jump is impressive! Research shows the deer can cover 30 feet between bounds! That is as long as a school bus! Because they can leap so high, it is difficult to find the right fencing to keep them out. The standard “deer proof” fence is often 9 feet high. The deer leaping in our verse for today are not doing so to escape a predator. They are leaping for joy! The mute tongue is not just finding its voice but shouting for joy! Water does not just trickle out in the wilderness but gushes out, forming streams in the desert. This imagery is a beautiful depiction of what Christ’s return will do for His own. There is already a partial fulfillment in the re-peopling of Zion or Jerusalem, but the complete fulfillment is larger and still to come. Thank you Lord, for the sure hope You give me! Help me to see past today. Categories: Comfort, Heaven, Hope | Permalink. I wonder if I am fooling anyone with these flowers. I know they fool the poor humming birds flying over to check them out. 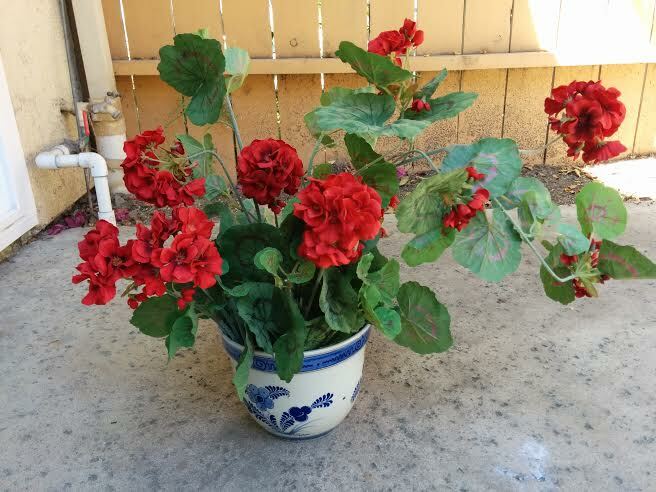 I bought these fake geraniums to stay fresh and bright looking without having to water or care for them. There are never any leaves to pick off and it is always perfect looking. But it is just not the same. There is no fragrance. Even with aphids or dying leaves, the real thing is so much nicer. Our verse for today tells us to turn away from what is falsely called “knowledge.” It might look like knowledge but is not the real thing. If what we are hearing is discounting completely God’s existence, then it is “godless.” It can sound really intelligent but if these ideas oppose the absolute truth of Scripture, then it is not true knowledge. Those who adopt what opposes Scripture will eventually leave the true faith. Turning away from these ideas that pretend to be true knowledge is not done in pride and censure. It does not mean that we “write off” those who hold to these ideas. We turn away so as to not be enticed ourselves nor to align ourselves with what contradicts that which God has made clear in His Word. It is the Lord that gives wisdom, from His mouth come knowledge and understanding (Prov. 2:6). We all possess some degree of knowledge (I Cor. 8-1-2) but with love and humility I can avoid allowing that knowledge to puff me up! Lord, keep me turned away from false knowledge but loving the one who is deceived!